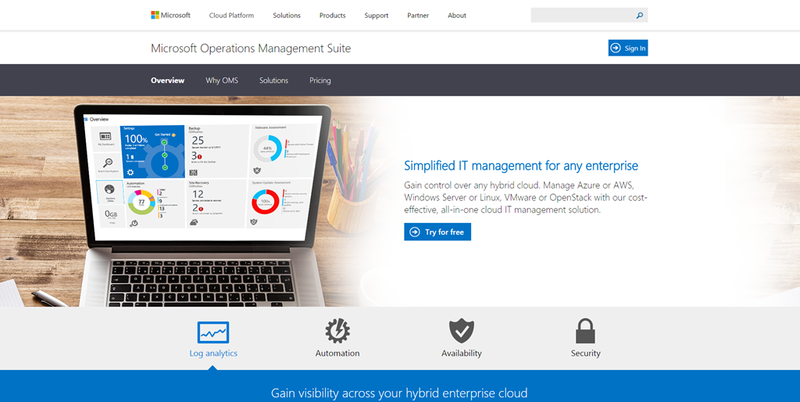 During the Microsoft Ignite event new “Operations Management Suite” which is the new name for Azure Operational Insights announced. What´s new with this cloud based solution other than the name change is the fact that this no longer just contains log analytics and the things we’ve seen before. It is now also now capable to manage your Azure backup jobs, Azure Site Recovery and Automation. When it comes to onboarding, it´s the exact same process as there was to onboard Azure Operational Insights (and System Center Advisor before that) and there are still two ways to connect the servers to the solution. If you look at the product history you’ll find this would grow to a similar solution like SCOM where you’ll be able to manage on-prem servers as well. Once onboarded you can go through the wizard and add your Azure subscription and start connecting the components. For the VM’s you can install the agent. One thing I like about OMS is the rich dashboard just like previous version. It’s easier to navigate and get required information. Another thing that´s gotten a new name are the Intelligence Packs known from the Azure Operational Insights days. They are now called Solutions instead and besides from the ones that came along from OpInsights. Apart from that Microsoft has confirmed this solution has be extend to monitor VM’s hosted AWS, VMWare, OpenStack and also monitoring Linux VMs. This given the clean vision how broader Microsoft is looking and OMS.